The age of a smartphone and computer-driven society has paved ways for a new form of aggression: cyberbullying. Georgia State is no exception to the matter– some students have pointed out the @GAStateTruths Twitter account, which brought this issue to the university by publishing anonymous tweets from second parties. “[Student’s name] in my theater class is a fake fatt fuckk,” an anonymous tweet from @GAStateTruths said. 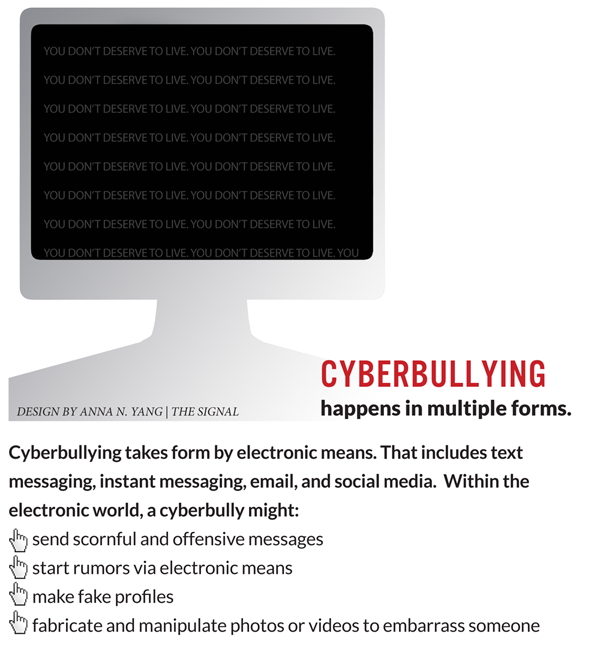 Cyberbullying is bullying by electronic means. This can include mean messages sent over social media, text messaging, emails or instant messaging. Other examples include spreading rumors or embarrassing information about a person over the Internet. Many Georgia State offices began to combat this issue by sponsoring the “Enough is Enough Campaign to Stem Societal Violence” event, which went from April 1 to April 5 and was purposed to educate and promote peace on campus. Social media violence and cyberbullying were some of the topics chosen for the events of the week. Kerry Wallaert, coordinator of Residential Leadership and Civic Engagement at Georgia State, was a speaker at the Enough is Enough event. Wallaert said the @GAStateTruths account was also brought to her attention by another student. Wallaert said she saw the Twitter account grow from 300 followers to 500 followers in a matter of days. The first tweet on the timeline dates to March 23, 2013. Wallaert said she receives cases of attacks on social media in the university housing frequently too. “Within the past month, there has been probably at least six solid cases I can think of that involve social media,” Wallaert said. Wallaert said she reports the severe cases of cyberbullying to the Dean of Students Office under the violation of threatening in the Student Code of Conduct. She is not aware of any regulation that directly addresses cyberbullying although any complaints can fall under threat. According to the Associate Dean of Students, Lanette Brown, no records are categorized for complaints of online threats. According to Enough is Enough’s library of statistics, a part of the problem is that some tend to think the victims were subject to the bullying in the first place. About 58 percent of youths agreed the victim “deserved” to be teased and wanted to “get back” at the person. Twenty-eight percent said they cyberbully out of entertainment. The Office of the Ombudsperson deals with students, staff and faculty experiencing stress and conflicts on campus. The ombudsperson remains neutral while resolving conflicts and directing individuals to other resources that may help. Kelley Alexander, student/staff ombudsperson, deals with disputes between students. Alexander has had some cases of cyberbullying. She said some students didn’t even know that there was a name for harassing others online. The ombudsperson has seen youths that eventually committed suicide because of bullying and cyberbullying. However, Alexander believed the impact of cyberbullying is more insidious compared to traditional face-to-face bullying. In addition, 81 percent of youth agree cyberbullying is easier to get away with than traditional bullying, according to Enough is Enough. The Faculty Ombudsperson, Dr. Valerie Fennell, said in way bystanders could be a part of the problem of cyberbullying too. Some bystanders join the bully and make the problem worse. Other bystanders try to not get involved in the issue to avoid harm. However, the bully then has freer reign to instill fear in others. “The more you encourage and give strength to bystanders to object to this issue, then the safer everybody is,” Dr. Fennell said. In an email sent by Tahrir Varner, coordinator of the Office of the Ombudsperson, the office does not sub-categorize complaints of cyberbullying either. “…but this year with the rise of cyberbullying incidents, it may be something we begin,” Varner said in the email.. According to The Cyberbullying Research Center, 49 states have bullying laws exclusively, and 16 states have cyberbullying laws. Georgia does not currently have a cyberbullying law in place. Sophomore Kelley Henry has been a victim of cyberbullying, and believed cyberbullying is an issue. However, she didn’t believe government should regulate the problem. Henry believed an argument against cyberbullying regulation is free speech. Wallaert, in contrast, believes having regulation regarding cyberbullying is a double-edged sword. “People will use the ‘it’s a freedom of speech’ thing…but then at the same time you are causing psychological harm to another individual and I don’t think anyone has the right to do that,” Wallaert said.